For several years, Autism Speaks had been considered as Theta Delta Chi’s “unofficial national philanthropy.” Several Charges supported Autism Speaks either by raising money or promoting awareness but there was no national network to bring it all together. This changed at a live meeting in November of 2011, when the 135 th Grand Lodge voted unanimously to make Autism Speaks, Theta Delta Chi’s official national philanthropy. 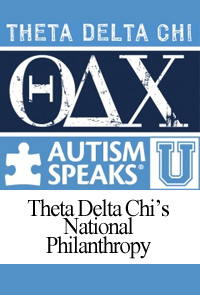 Theta Delta Chi’s Charges will work through Autism Speaks U, an initiative of Autism Speaks that supports college students in their awareness, advocacy and fundraising efforts. Since its inaugural event in 2006, Autism Speaks U has raised over $1 million and student Walk teams have brought in millions more. There are over 50 official Autism Speaks U chapters across the country and hundreds of schools that host events.